Stay positive – things will turn around! The Universe is an abundant place! Even when you can’t see abundance and good fortune, IT’S THERE! But you don’t really believe it. I was in that very same place of doubt, cynicism and fear just yesterday. Yup, it’s true. The great & powerful Money Manifester, Julia Kline, was feeling bleak. A big new client I’d thought was going to sign up didn’t; and you would have thought she was the last client on earth, the way I was bemoaning the situation. It’s embarrassing to admit how badly I reacted. After all, I teach other people how to attract wealth in any circumstance – heck, I channel an energy that infuses people with wealth attraction! But life just socked me in the stomach yesterday, in the form of this client, and all that Positive Mental Attitude crap flew right out the window! The person I was bemoaning all of this to was my accountability partner, Christel, who I called as soon as I got the bad news. Needless to say, I wasn’t pleased with this response. In fact I might have even stuck out my tongue at her on the video chat. Can you relate? Have you ever felt so committed to doubt and uncertainty that the mere thought of “staying positive” kinda makes you mad? OK good we’re on the same page. Just wait til you hear what happened next. I got off the phone with Christel, wrapped up my day and headed for home. As I rounded the corner of my building, I ran into a neighbor of mine who happened to be hanging out on the sidewalk. Mind you, I barely know this guy. We’ve been neighbors for years, but I know his first name and that’s about it. We exchanged a few idle pleasantries, as neighbors do. But my feet hurt, I’d had a hard day, I was anxious to end the conversation and get into my jammies. Wha … ??!!?? How’d you know that?? Turns out, this guy has been paying careful attention to my comments in our building’s Yahoo group. You know, the one where people go to complain when the elevator’s out, or they keep getting the wrong mail? He’s also read my book (there’s a link to it in my email signature – the one I use to make comments in the Yahoo group), thoroughly researched my website and even researched some of my testimonials! All in anticipation, apparently, of reaching out to offer me his business. And this is a guy, remember, who I barely know. I had no idea he was in need of hiring someone like me, or that he was quietly researching and studying me, to figure out if I really was the person he wanted to hire or not. I certainly didn’t have him on my radar as my next big client! He tells me he’s a managing partner of a LARGE restaurant group here in Chicago and he’s been tasked with straightening out their sales & marketing, company-wide. So he’s been in search of a marketing consultant and is impressed with what he’s learned about me. Who knew the Universe could be so literal? My next new client showed up just a few hours later. Standing right there, as I rounded the corner. Your next new ______ might be RIGHT AROUND THE CORNER!!! Wanna help make it a twofer today? I offer sales & marketing consulting services, ya know. 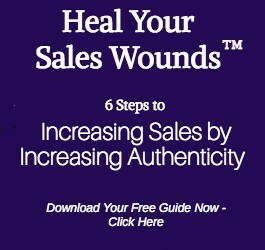 My next book, “Heal Your Sales Wounds,” will be in bookstores in May. 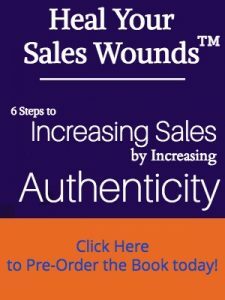 Pre-order your copy at 50% off now.